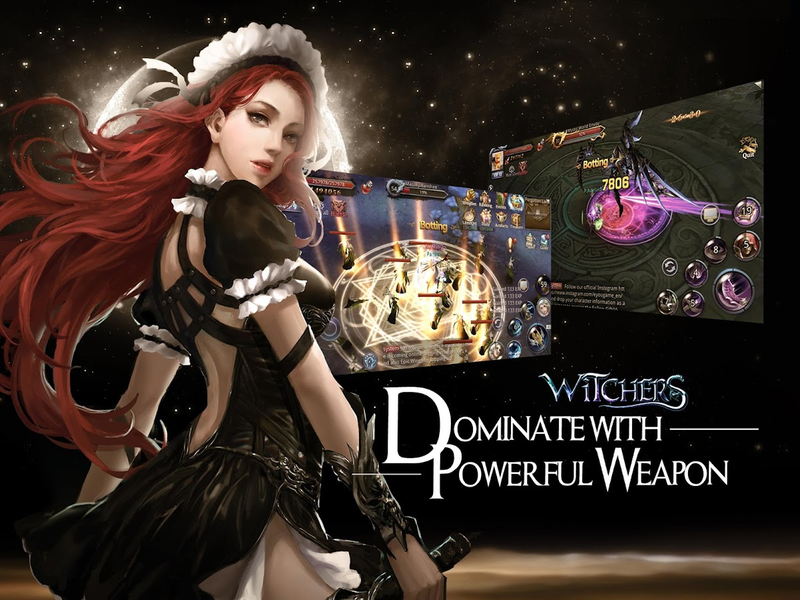 《Witchers(US)》MMO free world mobile game,amassive 3D masterpiece! ●3DMMOARPG hundreds of people fightfortheir territory! ●Not your typical pay to win game—free trading marketsystem! ●A brand new MOBA experience—10V10 team-fights happening inaninstant! ●Domineering mount pets—never leave andneverforsake! 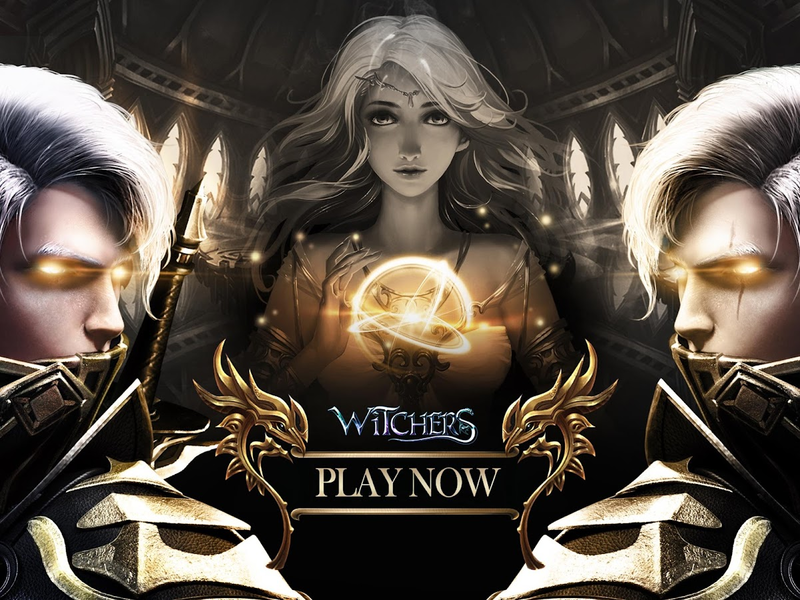 《Witchers》inherits the essence of the classic designs of a PCgame,Brawl PK battles』『Free trading』『Changeablefashionoutfits』『10V10MOBA』『World BOSS』『Territorialfight』and『Romanticweddings』 and more elements of a classic PC gameall presentedperfectly on your mobile device! At the same time,using the newlyintegrated 3D engine, re-making the elegance of thePC game and aseamless gaming experience. Relive the excitement offight alongwith your brothers, bringing a heavenly gamingexperience! Warriors,Assassins andmages, the classic triangular privity cooperation,performing theperfect 0 heavy sensation. Structured with fine andsmoothmovements, metals collision, blown away ultimate skills, anallshow mobile fascination! ——Three Dimensional socialcircle:personalize your profile, multidimensionalsocialization! Hugeamounts of fine fashions, cute monsters, andmulti changingweapons, showing your true self! Guilds and teams,fight for eachother’s life; Holding the hands of your love, worktogether withthe same heart. Make new friends and chat with eachother,real-time voice message……exploring in the mystical world willnotbe alone again! Brawl PvPbattles,Single player PvPs, Cross server 3V3s, multiplayer fights,Guildflag battles, territorial battles, 10V10 royal battle andmorereal-time PVP gameplay,anywhere,anytime. We would like to listen to the issues you are facing, don’tkeepthe inquiries to yourself, feel free to contact us! ●Domineering mount pets—never leave andneverforsake! ●Find your true love—experience a different lifestyle! 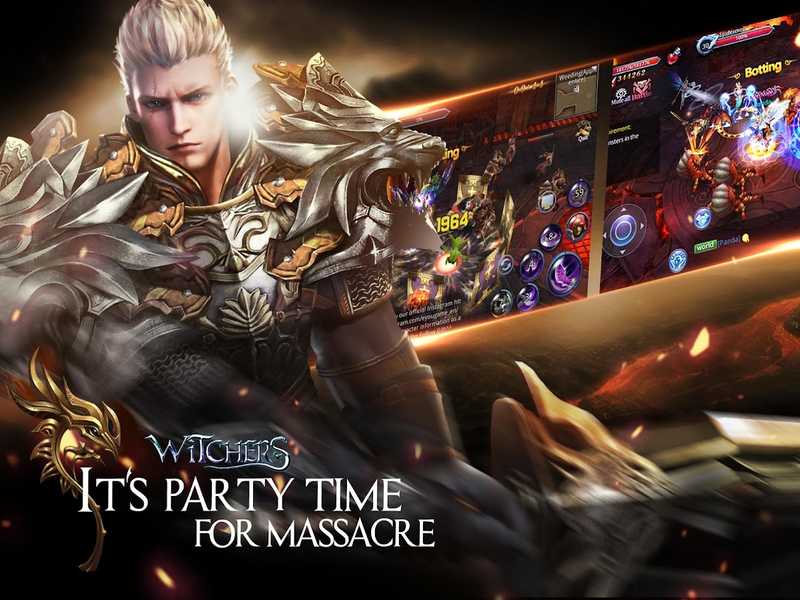 2017Epicmystical mobile game, making a 100% PC gaming experience withyourmobile,《Witchers》inherits the essence of the classic designs of a PCgame,Brawl PK battles』『Free trading』『Changeablefashionoutfits』『10V10MOBA』『World BOSS』『Territorialfight』and『Romanticweddings』 and more elements of a classic PC gameall presentedperfectly on your mobile device! 3 Minute Rounds! 3 vs 3 Action RPG meets MOBA!3v3 real-time onlineAction RPG, on your phone!Don't waste effort on your PC anymore.This game is the real evolution of MOBA.Short-game plays suited forthe mobile environment and continuously growing characters willprovide new excitement and experiences.40 legendary fantasyheroes.- Archers, Hunter, etc. Choose the class you want to play.-Tanks, ranged damage dealers, etc. Create your team with differentclasses.- Get more characters from treasure chests by winningbattles.An unprecedented league unfolds in 6 Dungeon Arenas.-Compete against other players to reach higher tier Dungeon Arena.-At higher tier Dungeon Arenas, more characters and rewards awaityou.- At higher tier, tougher opponents await your challenge.- PlayCampaign Mode to practice your skills or take down bosses.Playersall over the world are gathering to participate in this greatDungeon Arena. Take the throne by dominating them! Guide Witchers:Demon hunter free is one ofthebest Tips & Guide. This application contains a guide toplaythis game which consists of several tips and tricks to simplifythelovers of this game to complete each mission in the game.For Guide Witchers:Demon hunter will help you to manage yourgameaccount and improve fast! With many great tips, tricks cheatsthisapplication will help you to be a king of the game! Download itandread carefully all steps from application. After a while youwillsee how you account become stronger and bigger and you as aplayerwill become a poferwull ally for everyone in this game.Guide Witchers:Demon hunter : This is a tips to the gameGuideWitchers:Demon hunter, With the new cheats for games forAndroid,which consists of a new hack and tricks to become GameMaster. Thiswill bring you more fun to play, helping you passthrough manyobstacles, guiding you a lot of tricks that you neverknow and youwill win quickly. 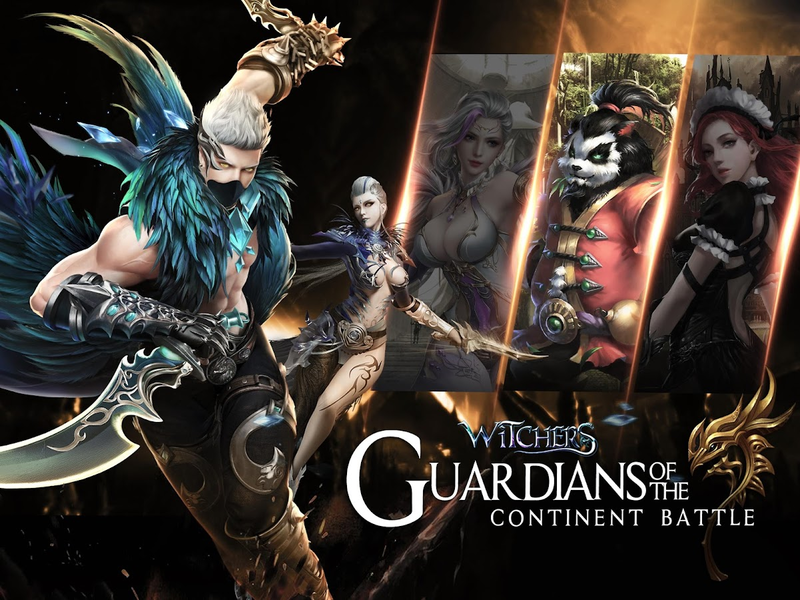 To Walkthroughs Witchers:Demon hunteris one ofthe best The Guide Witchers:Demon hunter 2 Tips &Guide.DISCLAIMER:All diversion name, pictures, characters, logo and differentpointsof interest are not made by us but rather by theirseparateproprietors. This application takes after the "reasonableuse"rules by US law, in the event that you feel there is animmediatecopyright or trademark infringement that doesn't takeafter insideof the "reasonable use" rules, please get in touth withusspecifically.This application complies with the guidelines of the copyrightlawof the United States of "fair use." If you feel there is a rightofdirect copyright or trademark infringement that does notfollowwithin the guidelines "fair use", please contact usdirectly.Tips Guide Witchers:Demon hunter free is one of the best Tips&Guide. This application contains a guide to play this gamewhichconsists of several tips and tricks to simplify the lovers ofthisgame to complete each mission in the game.This is a simple application that contain guides and strategiesonThe game. You can see strategies, tips, tricks and much more.Thisis the initial version of the app. We will improve it muchovertime.Guide Witchers:Demon hunter is the continuation of thefirstinstallment of Peter Parker's adventures, the GuideWitchers:Demonhunter, a self proclaimed law enforcer, who needs toface hisenemies again. Apart from an interesting storylinefollow-up, thegame offers an open world, a simple-yet-enjoyablecombat system,quite a lot of side missions and lots of elementshidden throughoutthe game world.NOTE:This is an UNOFFICIAL & Tips Guide Witchers:Demon hunterforapplication and made by fan!